Every year the great group over at Sprite Stitch cross stitch scenes from their favourite video games to create a one of a kind quilt to raise money for Child’s Play. This is the first year that I’ve been able to contribute. 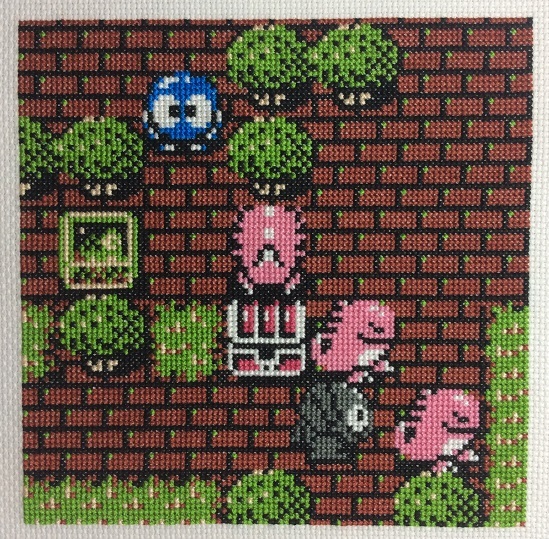 Here is my finished square – a scene from Adventures of Lolo 3. So many great folks contribute to the quilt each year that there are typically enough squares to create more than one quilt. One of the quilts always goes to the Penny Arcade Child’s Play Dinner and Auction, while the second quilt is typically sold in a way that allows more people the opportunity to win it. The second quilt created last year is being raffled right now. See pictures of the quilt and buy your tickets at RaffleRiver.com. Tickets are $3 each or 5 for $10 and the draw will occur on August 8. The time to contribute squares for this year’s quilt is almost up, but if you’re a cross stitcher, keep a look out for work on next year’s quilt to start. The squares are a lot of fun to stitch and help support a great cause.